The spending plan for 2019-20, which carries a $30.5-million tax levy, will be considered by district voters in May. The district, the poorest in Suffolk County, faces a $3.7 million budget deficit. The Wyandanch school board acted Wednesday to put before district voters a $77.8-million budget for the next school year — a figure that officials said will force a “heart-wrenching” choice of raising property taxes more than 40 percent or making devastating cuts in teachers, student busing, sports and other areas. Six trustees voted unanimously, with one absent, toward the close of a rancorous, two-hour meeting in favor of the budget that carries a $30.5-million tax levy, to be presented to district voters on May 21. That spending plan would represent a 9.19 percent spending increase. Several officials, admitting a hike that large could be defeated in the May vote and a June 18 revote, said cuts in services and programs might be the only alternative. 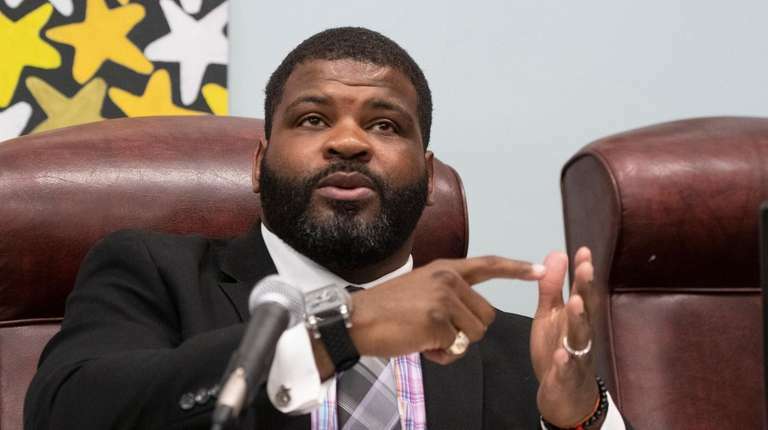 Ogundipe’s announcement represented a dramatic reversal from a statement several weeks ago that the district had dropped from consideration an attempted override of the local tax cap. A spending plan that pierces a district's tax-levy limit requires a 60 percent supermajority at the polls for passage. 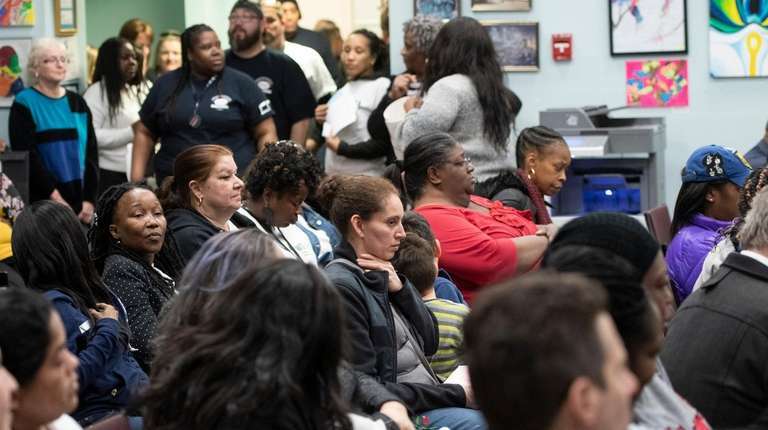 A standing-room-only crowd jammed the board’s meeting room, and at times the board members could barely be heard above shouts from the audience. About 100 people were seated, and many more people stood in the room and outside the door. Bobby Blassingame, a local civic activist, chastised trustees and accused them of careless spending, citing an August 2018 state audit’s conclusion that the board had spent $107,000 in attending conventions at a time when the district's finances already were shaky. Before the meeting, dozens of chanting, poster-waving demonstrators lined up outside the district’s Central Administration Building as the trustees inside readied for the budget presentation. "Putting students first! Putting students first!" shouted the protesting teachers and other school workers. A state comptroller's financial report, issued two weeks ago, found that Wyandanch's spending plan for 2019-20 is critically out-of-balance and, if not sharply revised, could result in painful slashes in student services and programs, beyond the busing reductions already proposed. The report also warned that district taxes next year could exceed state tax-cap limitations. The scathing new state report — the second by the comptroller's office in the past eight months — faulted district officials for persistently overestimating revenues, underestimating expenses and ignoring local fiscal projections showing a growing deficit. Community leaders, incensed by the widening fiscal crisis, had urged a big turnout at Wednesday's meeting. Residents said in advance of the meeting that they can ill afford a big tax increase. Wyandanch is the poorest school district in Suffolk County, with taxable income and property wealth barely one-third of the state average. Ninety-five percent of its 2,700 students are counted by the state as economically disadvantaged. 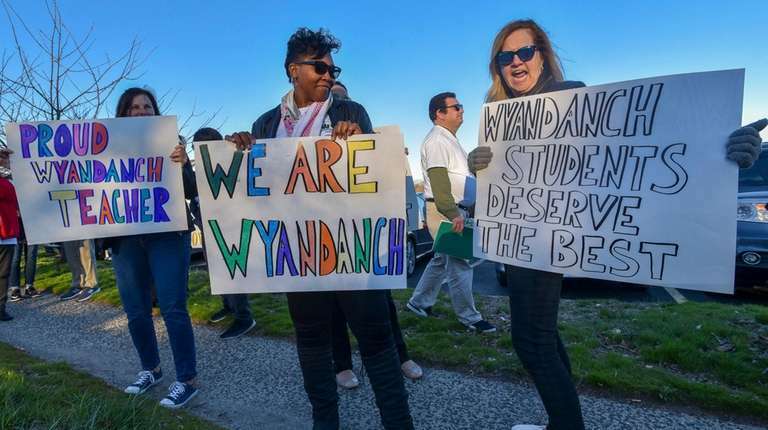 Nearly 70 percent of Wyandanch's expenses this year are paid through state and federal financial aid, compared with an average 32 percent for districts across the Nassau-Suffolk region, according to state financial data. Mary Jones, Wyandanch's superintendent since 2014, had acknowledged before Wednesday's meeting that proposed busing reductions and other cuts would be painful, but added the district's prime goal is to avoid larger class sizes or have to make other changes that would directly harm academic offerings. The district is weighing the possibility of replacing its own security guards with contracted services, to save money on benefits, as well as reductions in student transportation costs. Administrators caution that even if busing and security costs are reduced, they will have to eliminate additional millions in spending to balance the budget. One proposal that has parents alarmed would cut bus transportation — now available to all district students — back to the bare minimums required by the state. Current law mandates rides only for elementary students living at least two miles from their school and for secondary students living at least three miles away. Wyandanch's school board had recently approved a ballot proposition that would impose minimum bus requirements. That proposition will be on the May 21 ballot for voters' consideration. The proposition potentially could eliminate busing for more than 1,000 students, Newsday found in reviewing district financial data. Residents said any such move could endanger students who would be forced to cross railroad tracks that bisect Wyandanch from east to west or to walk along busy Straight Path, which runs north-south. Residents noted that the only alternative would be hiring more crossing guards — unlikely, given the shortage of funds. CORRECTION: A previous version of this story included an inaccurate reference to a school budget mentioned in the state comptroller's report. That report referred to the district's 2018-19 budget. School district's budget woes worsen, board saysBudget woes in the Wyandanch school district are far more daunting than originally thought, with cash reserves down nearly $3.3 million from original levels, shocked residents were told at a board meeting. Official scolds school board for inaction on deficitThe Wyandanch school board president said he was preparing a detailed response, adding the trustees had made no specific decision on deficit reductions but had sought advice from BOCES officials. Families: Erratic bus service leaving kids in coldParents in the deficit-ridden district are fuming over erratic bus service they say has left scores of young students out in the cold when their transportation doesn't show up on time. 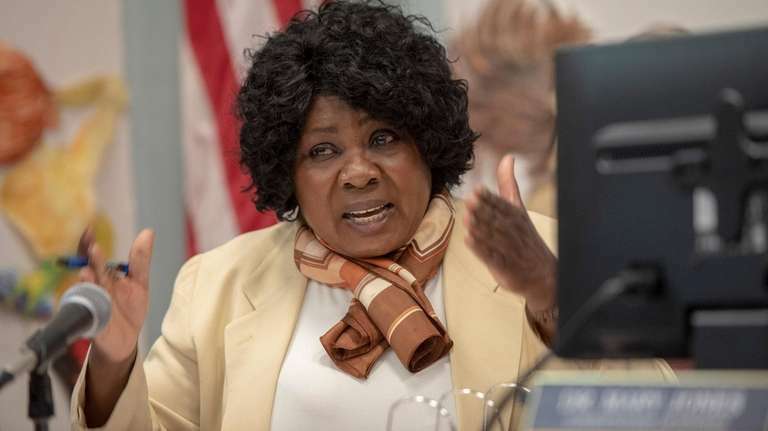 Wyandanch school leaders eye $1M-plus in bus cutsThe district's leaders face a $3.7 million budget deficit and a recent harsh audit by the state comptroller, who says it is "imperative" that they come up with a balanced financial plan.